Supplemental catalog subcollection information: American Libraries Collection; Historical Literature; Nov. 1911-1914, includes separately paged section, Musikalische Zeitschriftenschau, continued in Zeitschrfit für Musikwissenschaft. Supplemental catalog subcollection information: American Libraries Collection; American University Library Collection; Rare book preservation notes: Due to the deteriorated condition of this book, there were limitations with the digital preservation of this books. There may be pages missing, narrow margins or page content running into the gutter. Because of the historic uniqueness of this book, the book has been selected to be included in the library even with its imperfections. 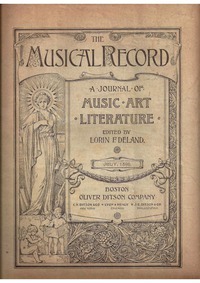 Description: Number 414 - July 1896 (The Musical Record); The Musical Record was a composer during the Romantic period; Piecestyle: Romantic; Music criticism|Writings|Publishers catalogs|Writings|Catalogs|For mixed chorus, piano|Scores featuring mixed chorus|Scores featuring the piano|For chorus with keyboard. Nouvelle-Écosse. Legislative Council. Library ; Nova Scotia. Legislative Council. Library ; Library catalogs ; Catalogs, Book ; Catalogues de bibliothèques ; Catalogues en volumes ; Film/Fiche is presented as orginally captured.